I’m not into crime novels as such but I tend to like them more if they are dark and/or weird. This one sounds both. I’m thinking of David Lynch. Well, it’s certainly dark a story, and the twist is very, very clever. David Lynch is not a bad reference point. It would be interesting to see what he would do with something like this as a basis. Thanks, Belinda. It is rather atmospheric and suspenseful. I don’t usually write about the crime novels I read as they’re often hard to describe without giving too much away! It’s nice to do one every now and again, especially for a story as good as this. Hopefully, it might encourage one or two other readers to give it a try. Dare I say the mood seems somewhat like a Modiano novel. It’s certainly strong on mood and atmosphere, but I found it much darker than the only Modiano I’ve read to date, Villa Triste. I’ll be interested to see if Guy has any thoughts on this as he’s read several of Modiano’s novels now, plus two or three by Dard. Maybe he’ll be able to give a better view. It would have made a great Hitchcock film, I was thinking. Aso, shades of Pascal Garnier (well, probably the other way round, since Garnier came after him). I’ve previously been rather dismissive of the San Antonio novels which Dard also wrote in huge quantities, but like Simenon he seems to have the gift of conveying a lot in just a few words. Yes, Hitchcock would have had a grand old time making adaptation of this! In some ways, it reminded me a little of Vertigo, also published by the same Pushkin imprint – there are some similarities, I think. This was my first experience of Dard, so I’m not terribly familiar with his San Antonio stories. They sound a little different to his novels of the night, more James Bond-ey judging by the comments in that Guardian piece? Yes, James Bondy would be a good way to describe them. And I too thought of Vertigo as I was reading this one! Ah…did you review it, Marina? I just took a quick look at your blog but couldn’t find it. If so, please feel free to post a link here. I had more reservations than you did about this one, which didn’t make my blog – I think MarinaSofia reflects my feeling it would have made a wonderful Hitchcock film I loved the atmosphere, and the beginning, and thought I was going to be 5 starring it, but I couldn’t swallow ‘the reveal’ as plausible. A film wouldn’t have given me time to collect my disbelief up. But, wonderful writing and characterisation and atmosphere, for sure! Ah, that’s very interesting, and it’s really good to hear an alternative view. I have to admit that I totally went with the explanation – but equally, I can see why others might consider it somewhat implausible. I suppose I just bought it on account of Albert’s state of mind and his level of disorientation once he found himself inside that apartment. (It’s difficult to say any more without getting into spoiler territory, which I’d rather not do.) A film adaptation would be great, though – we’re definitely aligned on that! In fact, it appears as though it was filmed back in the ’60s. A quick search on google threw up this link to Le monte-charge, which looks as if it was based on this very novel. I’m hoping that John from the Noirish blog might drop by as he may have seen it. Yes, I agree completely re spoiler avoidance. I did review it on Amazon, but it was, for me, 3 1/2 stars which I rounded up to 4, and my rule for myself for the blog is at least clear 4 star! I think psychology is really good in it, and I did love the atmosphere, which cranked my anxiety up higher and higher, TILL the reveal! As you describe this it sounds so interesting. Your summery of the early parts of the plot made me initially think that this was a character study that did not involve crime. As per Marina’s comment, I think that this has the potential for a good movie. For a novella of this length (around 120 pages), the central characterisation feels fairly well developed. As Marina was also saying earlier, Dard seems to be able to communicate quite a lot in just a few sentences. His prose is quite spare but very effective. Pushkin are doing such a great job with this series – doesn’t really seem to be a dud amongst them. At 120 pages it sounds right up my street. I’m trying to read shorter fiction to gain some reading momentum. Will check this one out. Thanks Jacqui! You’re welcome! I think you’ll really enjoy this one, Sarah – it feels right up your street. And yes, I agree with you about the whole Vertigo series, they’re very impressive – I’ve to encounter a disappointment. It’ll be interesting to see which other authors they’ll uncover in the future. Sounds fascinating, Jacqui – I’ve not read a lot of the Pushkin Vertigo books, but loved what I have. They certainly are putting out some interesting books. Interesting how the reveal can be divisive – I guess we all react differently to books, and the fact that the narrator is somewhat unreliable might make it more easy to accept! Pushkin are publishing some interesting books, and I like way they are using the Vertigo imprint to shine a spotlight on a number of these ‘hidden’ masters of crime. You might like this one, Karen – the denouement is certainly very original. Spiffy review, Jacqui! As you’ll have guessed, I’m aching to get my mitts on this — likewise the other Pushkin Dards. I’m afraid I haven’t seen Le monte-charge (1962), but onto my wish list it has gone. Thanks, John. This is definitely a book I would recommend to you, so it’ll be fascinating to see what you make of it as and when you take the plunge. The screen adaptation sounds very intriguing too, hopefully a candidate for the full Noirish treatment – I shall await your verdict with great interest! I also loved this and went on to read The Wicked Go to Hell which I didn’t like quite as much. I also have Crush – I hope it’s not going to be the law of diminishing returns! Isn’t it great? I’m so glad you enjoyed it as well. Did you review it by any chance? I couldn’t see anything in my list of saved reviews, but let me know if I’ve missed it as we can add a link. I was thinking about trying The Wicked Goes to Hell as my next Dard. Hmm…maybe I’ll leave it for a while to see how you fare with Crush. Do keep me posted on that – I’ll be very interested to hear! 280 books to his credit and i’ve never heard of this author! Where has he been hiding I wonder and did he and Simenon have a race to see who could finish writing their books first? Ha, yes – I can imagine there being a little healthy competition between the two of them. It’s good to see Pushkin returning some of these lost authors to us. They seem to have a knack for doing this with both the Vertigo imprint and the Pushkin Collection series itself. Yes, I included a link to that piece at the beginning of my post – you probably didn’t see it as the hyperlink is quite short. Thanks anyway! I’m not enough of a fan of noir to add this to the list, but you paint an intriguing picture. No worries, Simon. I know this isn’t going to appeal to everyone. There’s quite a strong psychological flavor to the story, so it might interest a few occasional readers of crime fiction. I think this will be my first Dard. I already liked Guy’s and Max’ review and yours makes it sound even better. I doubt all if husband 280 books are of the same quality but many are, I think. I’ll be very interested to see what you think, particularly in relation to other noir novels you may have read from this era. Yes, it’s hard to imagine any author being able to maintain a high level of quality once they get above a few dozen books, never mind two or three hundred. Hopefully Pushkin are cherry-picking some of his best here. I just saw that this is out of print in French. Too bad. Oh, no. That’s a shame. Maybe you could keep a lookout for a secondhand copy? Or read it in English? Ha, I was going to say the exact same thing as BookerTalk. I’ve never heard of this guy. But this does sound tempting… you always pick the best novellas! Thanks! I do love a good novella, especially one as suspenseful as this. It’s a good book to bear in mind if you’re in the mood for something dark and intriguing. 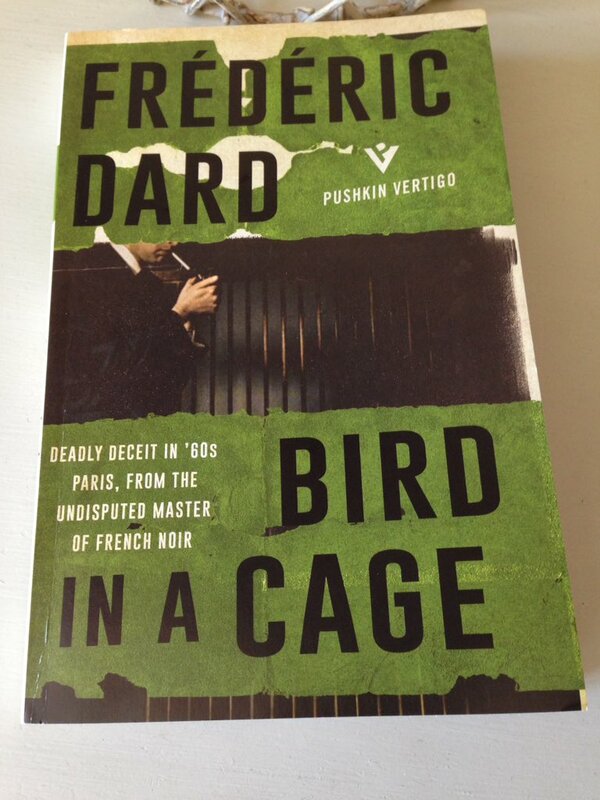 I’d never hard of Dard either until he appeared in the Vertigo range – all credit to the Pushkin team for winkling him out! You’re welcome. Thanks for writing about Dard in the first place – on the strength of this alone, he seems a real find. I’m glad you liked the The Wicked Go to Hell as I was thinking of making it my next Dard. Grant was less on it, but I guess we’re all going to end up with different favourites. Goodness I have never heard of this author. This sounds like an excellent read I enjoy things that are atmospheric. It’s good one to bear in mind if you’re in the market for something dark and suspenseful. Marina’s comment on the potential for a Hitchcock film is a useful reference point. Oh, I’m glad the sense of atmosphere came across in those quotes. It’s a very suspenseful little story – as Marina was was saying, Dard seems to have a knack for conveying a great deal in just a few brief sentences. Bird in a Cage would be an excellent place to start if you’re looking to take the plunge with these Pushkin Vertigo titles – I though it was very impressive for such a slim novella. Also very glad you liked it. It’s a winner isn’t it? And so much character and atmosphere packed into so little space. I do see why some find it gets a bit implausible, but I think that’s part of the genre. Hitchcockian usually to me suggests some fairly unlikely stuff going along. Yes, really terrific. I wouldn’t normally post on a crime novel that you and Guy have reviewed as you both do such a great job at covering these stories, but I enjoyed this one so much that I just had to write something about it. As you say, the characterisation is excellent – you really get a feel for the sense of desolation surrounding Albert when he returns to Levallois. And yes, I agree about the denouement. I couldn’t help but think of Hitchcock’s adaptation of Vertigo – there are some similarities between the two, I think. Oh… sounds a delicious one best consumed in one sitting on a dark cld winter’s night! Yes, that’s it exactly – the perfect setting to crank up the suspense.